Czech & Speake of London are a luxury brand specializing in bathroom & kitchen fittings and accessories. Their concept extends to a range of exclusive “aromatic fragrances”, eaux de cologne and after shaves. The scents are complex, rich, truly superb. I haven’t tried all of them (I would dearly love to get my hands on some Oxford & Cambridge, for example), but of those I have tried, No 88 is my absolute favorite. Allegedly based on an original Elizabethan recipe, No 88 has notes of bergamot, geranium, rose, cassie (acacia farnesiana), frangipani and sandalwood. Dark, deep and honeyed, the scent is stunning. It starts with a burst of sharp bergamot, which dissipates within seconds. Its dry piquancy is promptly replaced by the warmer spiciness of geranium. Simultaneously, sandalwood and rose become apparent. To me, the blend of these two notes is a union made in olfactory heaven. The warm, velvety wood and the dark-red roses of No 88 compliment and enrich each other wonderfully; the former bringing a smoky, vaguely incensey feel to the aroma of flowers, the latter infusing the sandalwood with mellifluous sweetness. The blend has the kind of disparity for which I invariably fall head over heels: it juxtaposes the austere elegance with the honeyed, exhilarating boozyness. It is dark and warm and enveloping. The nocturnal, opulent composition of No 88 has certain indefinable oddness about it that, for me, makes it reminiscent of the best Lutens creations. No 88 is a cologne, however, it has the lasting power and “the body” of a very lush eau de toilette if not an eau de parfum. It is marketed as a masculine scent, but there is no doubt in my mind that women who favor dark, woody florals, would adore No 88. 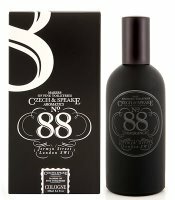 No 88 is available directly from Czech & Speake, £61.00 for 100ml, or from Apothia, $162 for 100ml. If my test-checkout is to be trusted, it is actually cheaper to order from Czech & Speake, since the final cost comes to about $158, including VAT and shipping to the States. The image is from czechspeake.com. It's going to be a great day, Marinushka ! I loved my little sample of this when I tried it last year and wanted to buy it for dh (hee hee!>;p) but for some reason didn't. Now, I have been wonderfully reminded about what a fantastic gift this would make. Thank you for the wonderful review today! So you like this better than Dark Rose (which I seem to remember doesn't work for you). . .I love DR, so I doubt that this will surpass that for me, but lemm, lemm. . . Wonderful, thank you so much for the information! Here is to a great day and a great week! I like it much more than Dark Rose. Something doesn't work well with my skin chemistry there, it goes too dry and sour. I truly struggle to see what you all adore in it so much :-D I still hope they re-issue it soon. Aw, I am sorry. The notes are like cats. They perversly stick to people who hate them, you know? :-) I have no problem with ger*n*um and it is not at all agressive on my skin in No 88. Well, as I read this I've just had two fragrance failures -- something alluring and d/c'd that has v*tiv*r AND c*dar, so of course it smells like a total horror on me. And Scrubber #2, with its unfortunate base of c*darwood... no wonder I have so many land mines in the men's dept. I am confused...was either of those failures No 88? Somehow I don't thik so since it has no pronounced vetiver or cedar nor is it obviously masculine...I think you'd like it! No, sorry -- a reference to Elle's dreaded geranium ... I have NEVER smelled a C&S. I'll catch up eventually... ps I'm still waiting on part of your pkg to send. there is a package being made for me? Woohoo! Thank you! Boozy? Okay, I'm out, but it really does sound awesome. I'm still waiting to one day smell some Dark Rose from them. Oh, I missed this one in my C&Z explorations, but I must try it now! Thank you for a wonderful review. Need to revisit 88. Had no idea how great the bottle was -- now I might just need it. And a special thank you to anonymous above -- I sort of forgot that Cambridge Chemists existed. I didn't even now about CambridgeChemists. $100 is a great price ..in comparison. Wow, went and viewed that Cambridge Chemists ... have you tried many/any of their men's scents?!? Yum! Also, related to your Baby Girl's fragrance needs, I remembered what it was I used to wear and love -- Mustela, the baby frag. Perhaps not cute enough for her, but I used to find it dreamy. I need to find a bottle, haven't smelled it in years! One of my faves :) Honestly, I do find it quite masculine, in an old-fashioned way, though. But why let that stop anyone of any gender, you know? It's so smoothly well done. And I would agree it has the potency of a much more concentrated eau than the label "cologne" would lead anyone to believe. A lot of depth to it. This was such a lovely review, M.
I've got to try that Mustela! I am really surprised they call it cologne. Perharps the term here used more in a traditional sense...like..men's scents are "colognes" and women's are "perfuems", you know? Has it been reformulated? Is the new formulation inferior? According to the knowledgeable ones at another blog, definitely yes. It seems as if it's been "watered-down" (S-T-S). The new version comes in a black square-shaped box, while the original version came in the gray cylindrical tube-like container. They used to also produce it in a 200ml version (at a discount), but now all they manufacture is a 100ml one. Oh no! :-( It would be such a shame if they watered it down. The decant I have is so sumptuous, "thick" smelling...oh well. I've been looking for the ultimate rose scent for a "male" to wear/proudly display and #88 has been on the top of my list. Would you agree or are there others that I should be thinking about? I've tried Montale's Black Oud and I found it to oud-y for my likings. Please help me on my quest for the rosy-HG! Have you tried Les Parfums de Rosine's two masculine rose scents? Rose d'Homme and the new Twill Rose? I absolutely adore them. Also, what about Voleur de Roses by L'Artisan? I've been trying to find a sample size of the Rose d'Homme and the new Twill Rose (although I do not think the latter is offered anywhere stateside yet). L'A was a bit to "patch-y" for my taste. Have you tried Penhaligon's rose-based offerings? I forgot to ask about Creed's Fleur De The Rose Bulgare - any thoughts on this one? Beautyhabit should have samples of Rose d'Homme. First in Fragrance in germany ships to the US, they should have samples of Twill Rose. Unfortunately I am not familiar with Penhaligon's rose scents or any of their scens really. As for Creed's FDTRB...I usually feel that all scents are unisex and anyone can wear anything they want...but this one does strike me as a rather feminine rose. Still might be worth a try, it is beautiful. Thanks again. I guess I should really try to get a sample of Creed's Rose then. As for beautyhabit, I previously looked and couldn't find how to get/purchase any samples from their website. I guess I'll have to look harder. Yes I checked the German website and I may get samples from them for both Rosin's.